WASHINGTON (92 News) – Chief of Army Staff General Raheel Sharif met the US Senate Committee on Armed Services led by Senator John McCain at Capitol Hill on Thursday. 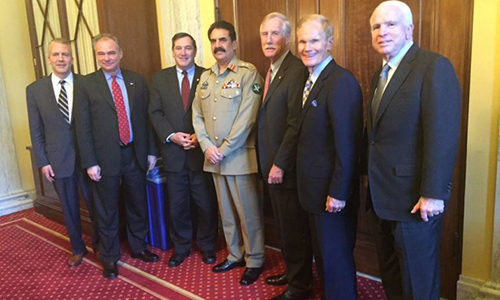 Senate Armed Services Committee Chairman John McCain, Senator Jack Reed and senior senator members welcomed COAS General Raheel Sharif. The COAS emphasized that terrorism is a global threat and warrants coordinated global response. With a clear regional security perspective, the COAS highlighted the need for stepped up Pak-Afghan border management and sustained cooperation to deal with emerging threats. The US Senate Committee on Armed Services acknowledged that Pakistan had turned the tide of terrorism. It also assured the COAS of US support and cooperation in eradicating terrorism and extremism. Senator McCain appreciated efforts, sacrifices and steadfastness of Pakistan Armed Forces, especially the COAS, in fighting terrorists on both sides of Pak-Afghan border. Appreciating longstanding Pak-US defense cooperation, Senator McCain stressed the need to further reinforce this partnership in view of emerging challenges. Senator Richard Burr and Feinstein noted that Pak Army’s perseverance and commitment had degraded militants in Pakistan.